I find it amazing that people do this. We have a cousin that can go for weeks to Italy with one of those overnight bags on wheels. I am better than I was. Down to just two pairs of shoes now. There was one time I only took one. After walking around all day in them you really don’t want to wear them the second day and it is bad for your feet. So I tried to buy a pair of size 10 women’s shoes in Italy. It was like I asked for a Yeti. They don’t exist or they are bizarre. Don’t ask about the looks of disdain from the shoe clerks. Never again. I am aslo a shop aholic. Sorry I am. So there it is and as much as I admire people with their tiny bags it ain’t happening with this girl. “Too much stuff” is an understatement. I’ve seen the luggage they use. The entire von Trapp family could have escaped Austria in it. No mountain climbing; just smooth, 4-wheel, 360 degree swivel action all the way to Italy. I told her to pack less clothes. Wash things out in the sink. Or the bidet. 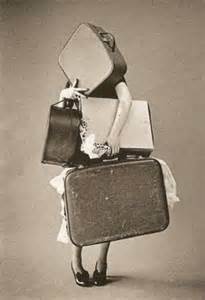 She said she packs very few clothes. But she admits her husband needs a new outfit every day along with matching shoes. Seriously?